Go On a Serene Buddhist Destinations Tour | Call On +91-993.702.7574 For Booking. On arrival Patna airport. You will be pick up & transfer to Bodhgaya. Check-in & Overnight in a hotel at Bodhgaya. After breakfast proceeds for a full day tour to Bodhgaya visit Mahabodhi Temple, Sujata Village, Niranjana river, 80 feet high lord Buddha Statue & Various international monasteries. Overnight at a hotel in Bodhgaya. B’fast in hotel and then will drive to Rajgir (65 Kms). Visit Gridhkutta (Vulture ‘s peak), World Peace Stupa, Venuvanaram & Bimbisar Prison. 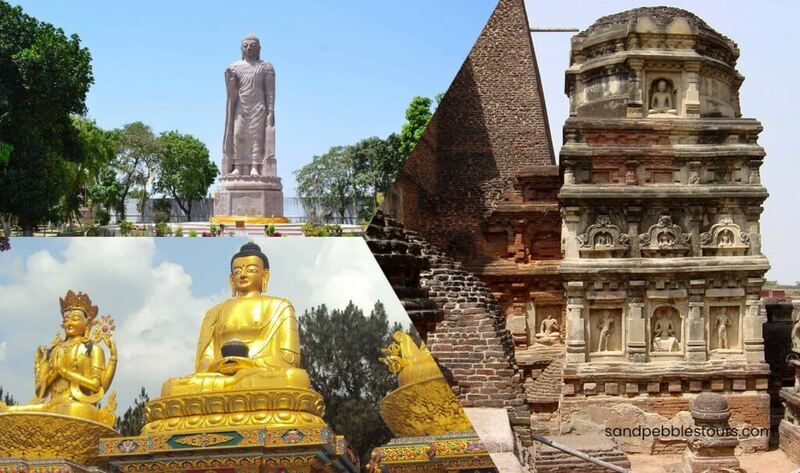 Drive continue to Nalanda (12 kms) to visit the ruins of world ancient University. It was one of the oldest Universities of the World & International Centre for Buddhist Studies. Evening back to Bodhgaya hotel. Dinner & overnight stay at a hotel in Bodhgaya. Early morning boat ride in Holy river the Ganges. Breakfast and drive toward Saravasti with packed lunch. On arrival, proceed for visit Proceed for visit Saheth (Jetvanaram) & Maheth (Angulimal Caves). Evening, back to hotel for dinner and overnight stay. Early morning drive to Kushinagar (approx 260 Kms / 7 hrs) en route visit Vaishali. On arrival check in to the hotel. Then proceed to visit Mahaparinirvana Temple (where Buddha took his last breath) and Rambhar Stupa (cremation site of lord Buddha) and Japan Temple. Evening back to the hotel. Dinner & overnight stay at a hotel. Breakfast at hotel and then drive toward Lumbini 170 km / approx 04 hrs drive) to Lumbini (in Nepal). Kindly obtain a double entry visa for India & single entry visa for Nepal). On arrival, check in at hotel. Then proceed to visit the Holy Birth place of Lord Buddha. Evening back to hotel. Dinner & overnight stay at hotel in Lumbini. Breakfast at hotel. Morning timely transfer to Lumbini (Bharwa Airport) airport to catch a flight to Kathmandu. On arrival, met and proceed for lunch in a local restaurant. After lunch proceed for visit Swoyambhunath Temple and Durbar Square. Overnight stay at Hotel in Kathmandu. Breakfast in hotel. Then will process for a full day s/seeing of Kathmandu city visit Boudnath Stupa, Pashupatinath Temple. Lunch & dinner in local restaurant. Overnight stay at hotel. Breakfast in hotel. Then you will be timely transfer to airport to catch flight for onward destination.